After your purchase of the external COPP_PC_with_display, you'll be provided with a file which contains a folder with your new COPP_PC_with_display. It's totally up to up you, where you want the external COPP_PC_with_display, to be located on your pc. You can now start using your new COPP_PC_with_display in projects. Lets assume that you are already using a COPP_PC_with_display, the one which is build into the editor itself. The external COPP_PC_with_display will work a little differently. Start by adding a COPP_PC_with_display in your project, as normal, and put in the enclosed serial number from the new COPP_PC_with_display. When finished downloading firm- and customware, to your external COPP_PC_with_display, you should be ready to use your new COPP_PC_with_display. When using the external COPP_PC_with_display you might upload a customware that is bad, and you might end up not being able to open the device before it just crashes again. Therefore it's quite convenient that we have a option to do a "master reset", which will remove any custom and firmware downloaded to the COPP_PC_with_display. There is two ways to do it. Using this method, we will first be needing to create a shortcut to our COPP_PC_with_display.exe. Then you'll need bring up the propeties tab, by right clicking the shortcut. 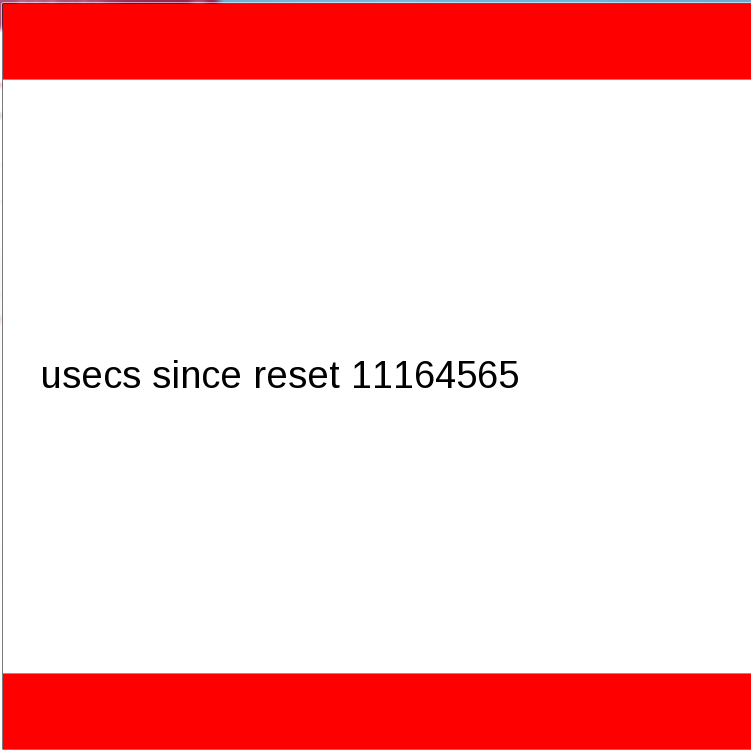 Then put in "-master_reset", after the last ("), and click apply or ok.
Now, whenever clicking your shortcut for the COPP_PC_with_display, you will master reset your COPP_PC_with_display. Therefore you might not keep the shortcut right besides your device, incase you click the wrong place and that causes a master reset. 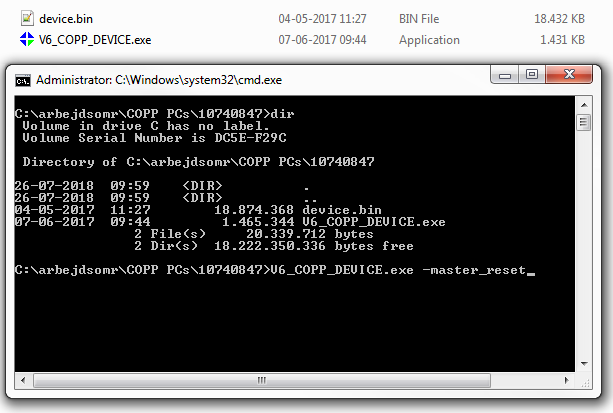 Using this method you will need to bring up a command window and give the COPP_PC_with_display execute file a commando. 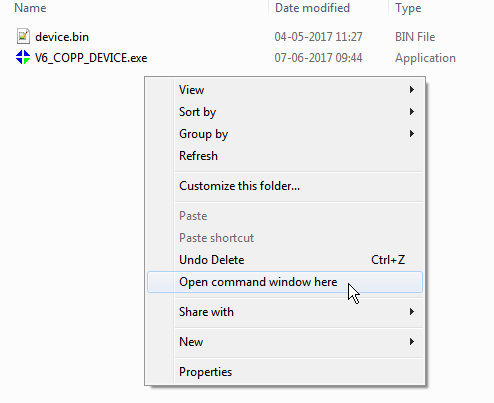 This can be achived easily by shift-clicking the folder, where you COPP_PC_with_display is located, and click "open command window here". 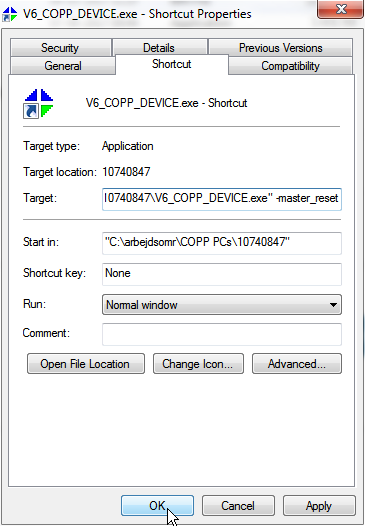 Now you should be able to execute your V6_COPP_DEVICE.exe, which is your COPP_PC_with_display, with the command (-master_reset). When executed, the COPP_PC_with_display will pop up in factory state.